Now Available for Pre-Order on Amazon, Barnes & Noble, Waterstones in Great Britain, and Indigo. Have to wait until June to read it? Dang! Another writer profiteering from Flint's decline? I will wait to read your book before I judge. Hopefully I will not be dissappointed. If not you'll fall into the same bucket as Michael Moore and Dapper Don Williamson. As a current resident I also reflect nostalgically on the city I grew up in and wish things were like they used to be. But they're not. Now we have to reflect proudly on our cities history, preserve that which reflects our values, and persevere to make it great once again. Just as we have done four times prior in our history. For those who are unaware, many GOOD things are occuring in Flint. The reinvention of Flint as a college town, The expansion of UofM Flint, MSU installing a medical degree program(s) in downtown, The Durant Hotel re-opening as luxury apartments, the expansion of Bishop Airport, the redevelopment of the Michigan School for the Deaf, the Redevelopment of the Hyatt as UofM Flint School of Business and Student Housing, the rennaisance of downtown, the achievement marking Flint as the hub of the I-69 trade corridor, Flint's first master plan in 52 years. The list goes on. It will take time. Let me just say that for all those expats who chose to leave know that Flintoids are NOT huddled in their homes afraid to go out. Life goes on. Kids play sports in the parks. The Christmas parade went on as planned in downtown. Restaurants are opening again downtown. Back to the Bricks and the Crim grow larger every year. Christmas lights are put up... the church's are still very alive and engaged in the community, we have 1000 more jobs in the city this year than last. All is not lost. Just as Jacob Smith ushered in a new era of lumbering after fur trading had played it self out and crraige building after that, Flint is simply transitioning from factory town to college town. It took us 40 years to get to this point, I expect it will take 20+ years to repair what is broken. If you want to make a difference... please go to: www.imagineflint.com and share your ideas on how to shape Flints' Future. Thanks for the comment. I appreciate you taking the time to share your thoughts on Flint and the book. My grandparents moved to Flint from the cornfields of Iowa at the turn of the 20th century in search of a better life in a town that was booming as a result of the emerging auto industry. My mother was raised on Illinois Avenue on the East Side, and I grew up off Dayton Avenue in Civic Park. As a third generation Flintoid, I share your concerns about someone exploiting Flint’s problems for profit. That was certainly not my goal when I began reporting, researching and writing Teardown more than four years ago. I love Flint, despite its bad reputation, and that inspired me to try and help the city. My book is the story of what happened when I journeyed to Flint from San Francisco and joined the efforts to improve it in some way. What I found was a place of stark contrasts and dramatic stories, where an exotic dancer can afford a lavish mansion, and speculators snap up cheap houses on eBay by the dozen like jelly donuts. As you probably know, there are desolate blocks where only a single house is occupied, and survivors brandish shotguns and monitor police scanners. While the population plummets, the murder rate soars. Throw in an arson spree and a racially motivated serial killer and I started wondering if Flint could be saved. I don't think you can write a serious book about Flint without acknowledging the city's very real problems. And yet, I discovered glimmers of hope. I befriended a rag-tag collection of urban homesteaders and die-hard residents who refuse to give up on the city. Dave Starr, a well-armed shop rat who logged 14,647 days in a G.M. plant, battles cancer and economic decline as he joins forces with his neighbors to preserve a lone block surrounded by decay. Pastor Sherman McCathern negotiates with God in his heroic effort to transform an abandoned church and improve the lives of his congregation. Mayor Dayne Walling, a Rhodes Scholar in his thirties who spent his adult life grooming himself to run Flint, has the toughest job in politics — one that sometimes necessitates police protection for his family. And Dan Kildee, a local politician and urban planning visionary, grabs international attention — and trades jabs with Rush Limbaugh — by arguing that Flint and other troubled urban areas should manage decline instead of futilely trying to stop it. As I rediscovered my hometown, I found that Flint has lessons for cities all over the world. And I learned that communities are ultimately defined by people, not politics or economics. 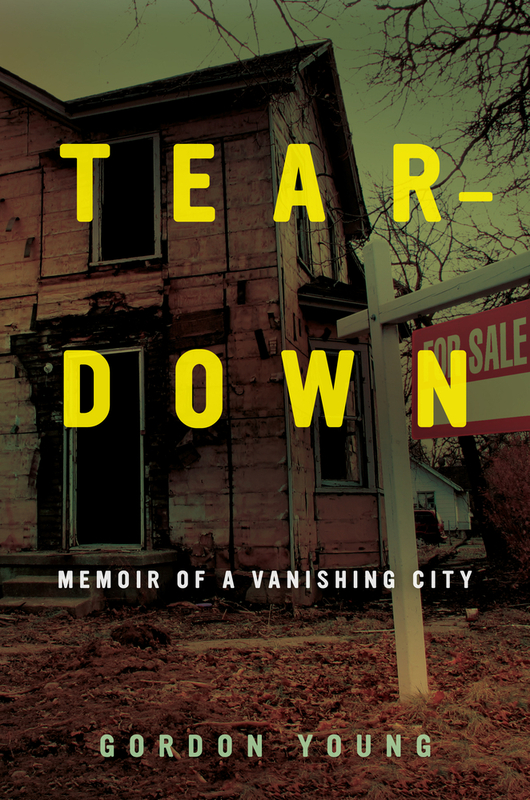 Teardown reveals that the residents of Flint are still fighting, in spite of overwhelming odds, to reinvent their city. In the end, I learned that you can go home again. But the journey is likely to be far more agonizing and rewarding than you ever imagined. So this was not about money. Anyone who understands today’s publishing landscape knows that a book about a troubled industrial city published by an academic press is not the path to riches. As the book explains, I spent a lot of my own money in the process of writing Teardown. Some of it was spent on expenses during my numerous extended trips to the city. Some of it was spent helping Flint residents improve the city. But you never know. Maybe the book will resonate with readers and turn a profit. That’s why I’ve pledged a portion of any profits to various Flint charities. You’re right to be defensive about how Flint is treated. The city has taken a lot of body blows in the national media. That's why I devote more space in the book to Flint's future than its past. I'm sure you probably wouldn't agree with everything in the book, but I think you'd find it was a heartfelt look at the city by someone who loves the place and wants to help it have a brighter future. Thank you for the ad hoc abstract it helps tremdously and I do look forward to reading about your experiences. You astutely picked up my defensive attitude and I appreciate you recognizing the origins from which my frustration is born. I returned like you to Flint in 2009 after maintaining dual residency in Tucson, AZ and Southern California. When the economy turned down in 2007 I was faced with living in my choice of three equally ecomomically depressed states., None of which to this day have yet to recover. So I returned to my home town, Flint to live permanently and witnessed the positive trends occuring equally aware of the stresses it faced. I decided the to go "all in" buy a home here and become as you a positive force for change whether big or small to help move Flint forward. No doubt that the things you speak of, the arsons, the serial killer from Israel, who pseudo randomly selected Flint to exact his evil are real... However, what doesn't make the light of day are the positive things that the PEOPLE of Flint are doing to turn things around and there are MANY examples of community activism and patriotism. Flint's people are solving their problem from within, albeit slowly and with limited reosources. We are not the weathy community we once were. But our heart, focus, and priorities are in the right places. They are working and they appear that they will endure (versus the last downtown re-development initiative). If you return again... I would enjoy meeting you and showing you the positive things to highlight. Perhaps I will send some pics to post on your blog to share and you can begin your sequel... "Reconstructed - The Incredible Re-appearance of a Vanished City." Todd, believe me, I understand. Thanks for all the great work you're doing. Let's try and connect the next time I'm in Flint. And keep me posted on Imagine Flint and other projects. Happy to post things on the blog. Only rich folks can afford to do things only because they might do some good...plus of course the ego-stroke that the individual gets when they are recognized for doing that good. In that regard, Mr. Moore and Gordon must have had other motivations. Mr. Williamson on the other hand was and is quite well off, so his motivation must have been a hope to do some good. It obviously wasn't "profiteering". Gordon's book, I gather, will be an honest and respectful presentation of where Flint's coming from, the strengths, resources and hopes it retains, and some examples of how the hopelessness with which outsiders might view it is unjustifiably negative. Mr. Moore's first Flint movie carelessly damaged our economic prospects by discarding truth, both on the strategic scale and in regard to its insultingly false depiction of particular individuals, in favor of a contrived story that better fit his political views and was calculated to make him a ton of money. I see a clear distinction between the three instances, and I'd only apply the term "profiteering" to one of them. Bought your book “Tear-Down”. I have written you before and donated a small amt to u to go toward tearing down a house in Flint. I can hardly put down your book. I am reliving so many moments. Flint is part of me, too. My 88 yr old Mom passed away last year. Possibly reading this, is bring back loving family moments for this 60-yr old! Thank you for writing this book. BTW, my 46-yr old step son’s favorite band is The Smiths! Deb, so sorry to hear about Beth. As you might have seen, my mom passed away last year as well at 87. Not an easy time. Take care.